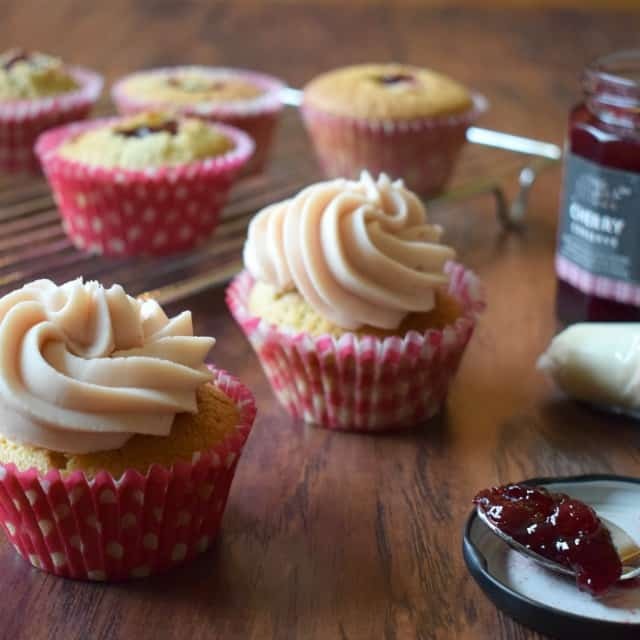 The delicious flavour combinaton of cherry & almond can be found in these pretty cupcakes. 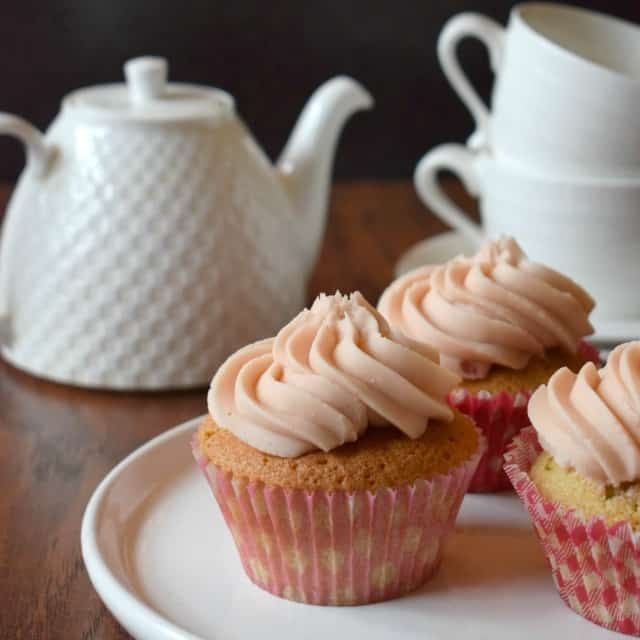 The pink colour of the buttercream frosting make them perfect for a girl’s birthday, Valentine’s day ……. or simply just because. If you popped into my recent side-by-side baking post where I looked at eggs curdling in cake batter, you may have been left wondering what I did with the cupcakes. Well, those plain and humble cupcakes were very simply transformed into these pretty and inviting Cherry and Almond Cupcakes. 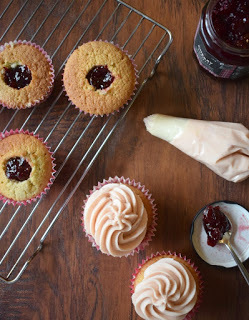 That soft pink icing, which is so pretty, is courtesy of the addition of a little cherry jam! There’s no added colours, or ingredients with fandangled names or numbers, just a spoonful or two of simple cherry jam! How easy is that? And that lovely pink colour surely makes them suitable for a girl’s birthday party, a Valentine’s day treat especially if they were sprinkled with a few mini sugar hearts ….. or even just because! I’m sure you don’t need me to tell you how delicious the cherry and almond combo is. It’s such a polular flavour combination and for very good reason. Think of a classic frangipane tart and I’m sure you’ll realise what I mean! So, let’s get to it and bake Cherry & Almond Cupcakes! for a girl’s birthday, Valentine’s day ……. or simply just because. 1. Preheat the oven to 190℃ / Fan 170℃ / Gas 5. Place the muffin sized cases into the muffin tray.2. Make the sponge. Place the margarine or soft butter and sugar into a good sized bowl and beat together with a wooden spoon or electric beaters until very pale and fluffy. Add the salt and almond extract and beat again to combine. Gradually add the beaten egg a little at a time, beating well after each addition. Beat in the milk. Sieve the flour into the mixture. Use a spatula, large metal spoon or your hand with your fingers splayed to fold this in gently. 3. Fill the muffin cases. Using a teaspoon, fill the cases with the batter mixture. You’re aiming for them to be half to two-thirds full. You may decide to weigh each muffin to ensure equal sizes. Each will weigh about 62g.4. Bake. Place the muffin tray in the centre of the oven and bake for about 20 – 23 minutes. You may need to rotate the tray after 15 minutes of baking. Once baked, remove from the oven and place on a cooling tray.5. Make the buttercream. Place the softened butter into a good sized bowl. Beat to ensure it is soft and creamy. Sieve half of the icing sugar into the butter. Use a woodenspoon to combine the two ingredients. Sieve in the remaining icing sugar and mix to combine. Beat well to create a creamy frosting. Add the cherry jam (omitting any pieces of fruit to ensure it doesn’t block the piping nozzle). Mix to combine. Add a little milk if necessary, and beat in. Spoon the mixture into a piping bag fitted with a large star nozzle. 6. Hollow out the cupcakes. Use a paring knife or the wide end of a large piping nozzle to create a hollow in the top of the cupcake. 7. Assemble. With a teaspoon, fill the hollow with cherry jam. Pipe the buttercream over the top of the cupcake in a generous swirl. 8. Enjoy! 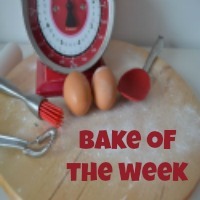 a) Aim to ensure your ingredients are at room temperature before baking. Consider very gently warming the lightly beaten eggs over a double boiler if the eggs are chilly, especially in the colder months. Heat them until they are tepid (neither warm nor cold to the touch). Add them to the beaten butter and sugar as usual. These look so pretty and the cherry jam in the buttercream gives it a lovely pink hue and I'm sure a great flavour too! These look so pretty and what a good idea flavouring the buttercream with jam- Neat trick! Thankyou Jacqueline, it's amazing how nicely the jam works in the buttercream, though I think it brings more of a colour than a flavour given that there's not too much jam in it. Those look so good! I love cherry and almond and definitely like the idea of "stuffed' cupcakes! Aw thankyou Ali, I love popping a spoonful of jam or curd into cupcakes, it brings a lovely little surprise. They look delicious. I love the cherry jam inside them, such a great idea. These cupcakes look so cute and must be delicious, I love the cherry-almond combination. And I really like the idea of 'stuffing' the cupcakes with the cherry jam!